Publishers Balking at Apple's 30% "Pay to Play" Tax? "Lots of hullabaloo about Apple's iOS subscription product. The basics - everyone pays 30%, you can't charge more on the iPhone for the product than you do on other platforms, and you can't link out from the app to the browser to handle subscriptions without Apple being in the middle. It's not even clear that apps will be able to just post a message telling people to create an account from their computer and then come back to their iPhone and use the app." 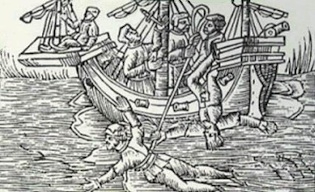 Interesting that the term "keelhauling" is being used here. There seems to be a significant amount of anger and resentment expressed in the press about Apple's new services. Publishers claim that they won't be able to make money paying 30% to Apple. Understandable for services that are barely breaking even. So, does this force iOS users into mass-jailbreaking and using "other" app stores? Does this drive users to Android? Personally I think (or at least hope) that Apple will eventually work with content publishers to come up with a (different) model that works.